It only takes one bad fall or a debilitating illness for an elderly loved one to need assistance in daily needs. If your parent was being released from the hospital after surgery or due to an illness, would you know where they could recuperate? If your mom needs daily care or has long term needs and you cannot care for them, do you have a plan in place? In the assisted living industry, we meet many families in crisis. They don’t know what to do when a parent can no longer live alone and needs immediate care. They may be under stress about a loved one in the hospital or ill. They may feel the growing anxiety and guilt of no longer being able to care for a parent alone. Families maybe facing a multitude of questions and concerns about who and where will provide the best care for their mom or dad. Making a decision of who will care for your loved one during a crisis and under pressure is far from ideal. The Red Crisis File is a program that Aegis Living developed after years of witnessing families in a crisis. Before there is an emergency, our Aegis team can walk you through the legal forms and documentation step-by-step that are required by the state to move your mom into a short term stay to recuperate from the hospital. Whether it be for assisted living for those who can no longer live on their own, or memory care for those with dementia and Alzheimer’s. We create a file with the required documentation, along with emergency information, photo ID, and medical authorization to expedite the transition into assisted living when needed. If you wish, Aegis can keep a copy of this file at the Aegis Living community of your choice in case you would like to one of our locations to be part of your care plan as well. By having this file and checklist of documentation completed, your family will have the peace of mind that in the case of an emergency you are ready to quickly move your parent into the care that they need. Your parent can participate. Completing this documentation can open the door to a sometimes difficult discussion with your mom about her future care. It provides your mom with the opportunity to participate in her own plan and communicate herbexpectations. No delays. To complete the documentation, you are able to schedule appointments with lawyers, doctors and pharmacists, when it works with your schedule. Your family will not be forced to scramble for assistance. Memory care. Many of our families who have a parent newly diagnosed with dementia or Alzheimer’s will find great comfort preparing this material now. It can be difficult to predict when a loved one may need more specialized care due to memory loss. Expert Assistance. The legal documents required by the state take time and understanding to complete. Our experts can walk you through the details and answer your questions. You have someone on your side. Peace of Mind. Your family can find comfort in having a backup plan in place for the unexpected and being proactive about the future care of their loved one. Know that by completing the information, you can be certain that there is no obligation to move your parent into an Aegis Living community. This program provides you with the documentation that you will need on hand in the case of an emergency, wherever you may bring your loved one. The Red Crisis File is always free. We take pride in providing this public service and raising public awareness for families caring for elderly loved ones. 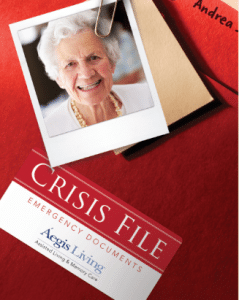 Call or stop by your local Aegis Living community today and pick up your Red Crisis File. Our team will gladly walk you through how to start being prepared.